Oh, we've seen a lot of Chicken Milanese recipes in our days, but this one—with fresh parsley and a garlicky RITZ Cracker crust—is our favorite. Mix mayo and garlic in pie plate; mix cracker crumbs and parsley in second pie plate. Dip chicken in mayo mixture, then in crumb mixture, turning to evenly coat both sides of each breast with each ingredient. Heat 2 Tbsp. oil in medium nonstick skillet. Add chicken, in batches; cook 4 min. or until done and evenly browned, turning after 2 min. and adding the remaining oil as needed. Serve with a steamed green vegetable, such as broccoli, and a cold glass of fat-free milk. 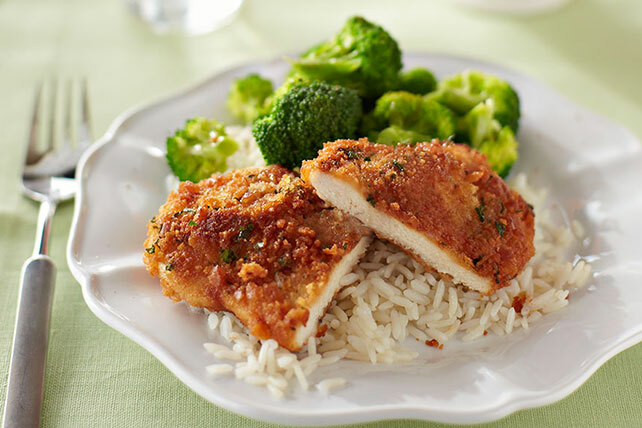 Substitute pork loin cutlets for the chicken breasts. Prepare as directed, substituting mild white fish fillets, such as catfish or tilapia, for the chicken breasts. Do not pound fish fillets to flatten. Also, reduce the cooking time to 3 min. on each side or until fish flakes easily with fork.